This story was originally published Sept. 14, 2018. 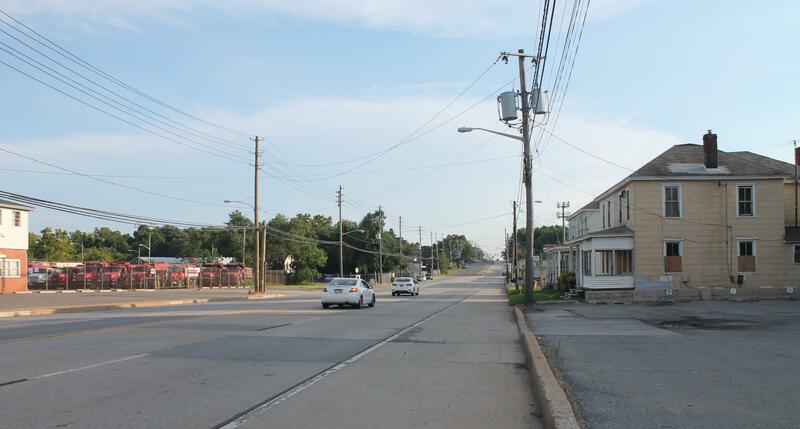 New Castle County has finished surveying residents of two communities along Route 9 about environmental conditions in their neighborhoods— and whether they might ultimately want to relocate, if given the opportunity. Delaware Public Media's Sophia Schmidt reports on a survey of Eden Park Gardens and Hamilton Park about environmental conditions and relocation. Eden Park Gardens and Hamilton Park have faced more than a few environmental issues over the years—enough to make a step as radical as relocation worth entertaining. Hamilton Park and Eden Park sit off Route 9, just south of Wilmington City limits. The view of Hamilton Park from Route 9. They’re majority African American communities, with median annual household income around $32,000, according to the Wilmington Area Planning Council’s (WILMAPCO) mapping analysis of available demographic data. 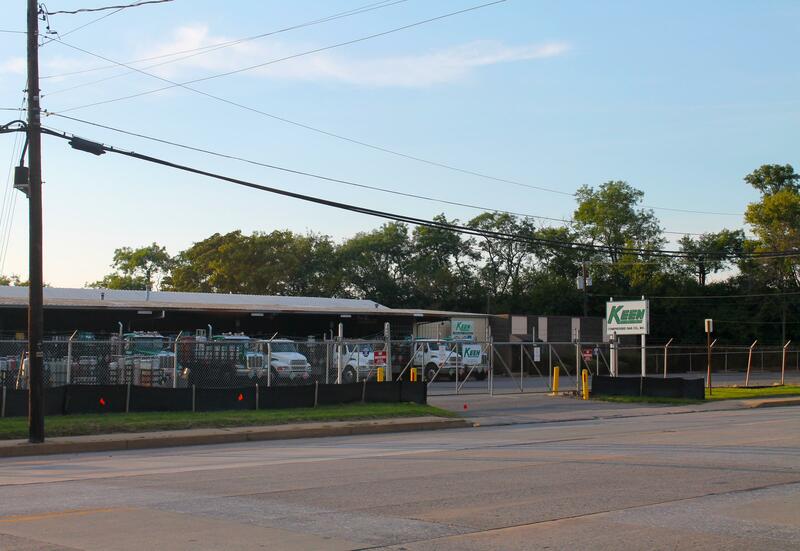 They’re nestled between companies like Keen Compressed Gas, Bruce Industrial and Diamond Materials, a paving and concrete contractor whose huge, uncovered mounds of materials tower over Route 9. The neighborhoods are also located near the Halby superfund site— where a chemical manufacturing plant once stood. Primary contaminant concerns at that site are arsenic and carbon disulfide, but according to the EPA, human exposure and groundwater migration there are under control. Residents also complain of airborne dust from nearby industry, and emissions from the many trucks that drive through on their routes, and to and from the Port of Wilmington. Issues like these led some in the community to raise the idea of relocation. It was part of a 2004 lawsuit in which more than 250 Eden and Hamilton Park residents filed against roughly 30 local companies— such as Clean Earth of New Castle, Wilmington Chemical Corporation and Greggo & Ferrara. The relief sought by the plaintiffs included fair value for their homes. “We sued that either you move your industries or move us,” said Pastor Louis McDuffy, president of the Eden-Hamilton Park Civic Association and longtime community leader on environmental issues. McDuffy says most plaintiffs received a check for property damages, but a buyout did not occur because the neighborhoods did not achieve the required consensus. County officials say occupant homeownership is slightly higher in Eden and Hamilton Park than in many of the surrounding communities. According to the County, there are 32 vacant lots among the two neighborhoods. Less than seven percent of houses in the neighborhoods are vacant, and roughly 15 percent of units are rentals. "You have the allergy problems, the depression. With my father, he had a massive heart attack, and my mom got cancer. I had a heart attack and cancer." Marcia Mason has lived in Eden Park her whole life. She says for the last 15 years, she hasn’t wanted to. Mason’s biggest concern with the environment in Eden Park is health. And she says air quality in the neighborhood affects her daily quality of life. 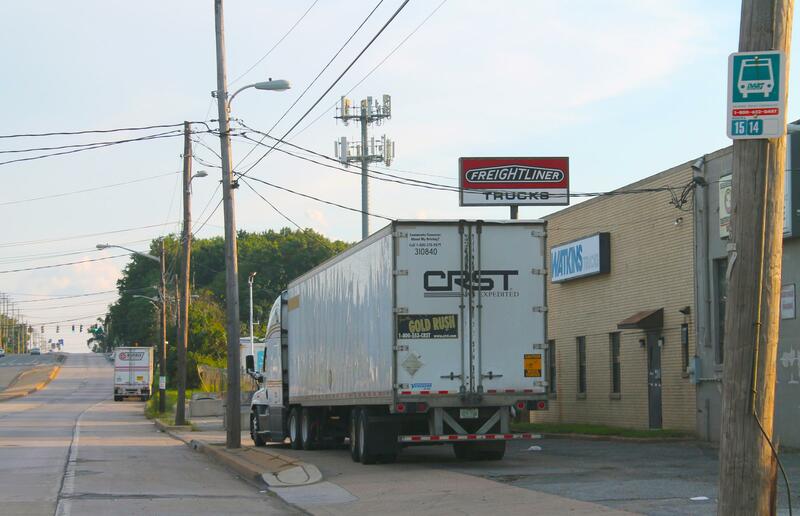 Several trucking companies are located near a bus stop near the Eden and Hamilton park on Route 9. She says the neighborhood’s environmental issues have a constant visual presence. Ervin Whitehurst grew up in Hamilton Park. WILMAPCO Planner Bill Swiatek calls the area around Eden Park and Hamilton Park an example of bad zoning. "In the case of Hamilton Park and the case of Eden Park, they're completely surrounded by industrial land ... It just sort of developed haphazardly." And Swiatek says the result is the ‘public health’ concerns residents face today. 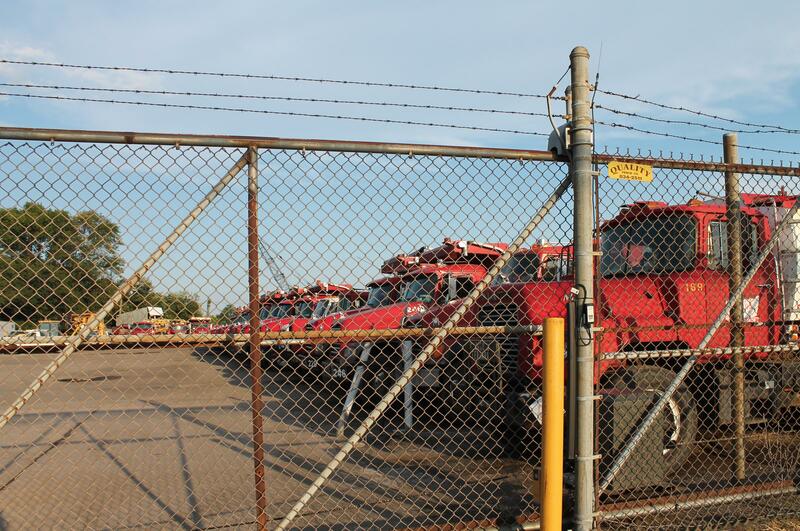 “Concerns about dust that DNREC has detected in high levels, concerns about the truck traffic, all kind of tie back to the way the land was zoned,” he said. In 2015, New Castle County tasked WILMAPCO with preparing a master plan for the Route 9 corridor. One of the plan’s main recommendations is that incompatible uses— like residential and heavy industry— be separated wherever possible along the corridor. It recommends the County look into the possibility of relocating residents of Eden and Hamilton Park and letting that land develop with more business or industry. Swiatek says the idea of relocation came from discussions with residents. Last year, New Castle County government began to act on on WILMAPCO’s recommendations. The County hired a third party to conduct the census-style community survey on whether residents want to relocate, or would prefer another solution. Dr. Victor Perez is a professor of sociology at the University of Delaware with specializations in environmental justice, health and illness, and the sociology of risk. "The idea of relocation predicated on ... lived experiences of environmental burdens is relatively novel." He developed the survey with the help of community members over several months— and put it in the field early this summer. “Providing essentially a platform for an objective assessment of how people feel about these issues, today,” said Perez. The survey was anonymous and voluntary. Residents were compensated $10 for their time. The survey was conducted orally and took roughly twenty minutes to complete. Relocation was just a portion of the survey. It also asked about health, perceptions of pollution or environmental issues, and residents’ feelings on other hypothetical changes in the area— like revitalization, rezoning or environmental regulation. But the survey did ask how likely residents would be to relocate if given certain financial assistance or the value of a home in a similar area. It asked about other barriers to moving too— like age or social ties. It allowed residents to express their views in their own words, as well as using scales. Residents could also answer that they think there are no environmental issues in their neighborhood. Surveyors made clear to residents there is currently no funding available for relocation. Carrie Casey with New Castle County says the County has not made any decisions about what might happen if survey results say the community is overwhelmingly in favor of relocation. Nor has the County done any calculations about how much relocation might cost, or studied what fair relocation might look like. She says the County doesn’t even have a plan for next steps after survey data are analyzed. “The first key thing for us is seeing what the community really feels about this,” she said. "We're going to work as hard as we can to meet the community's expectations." 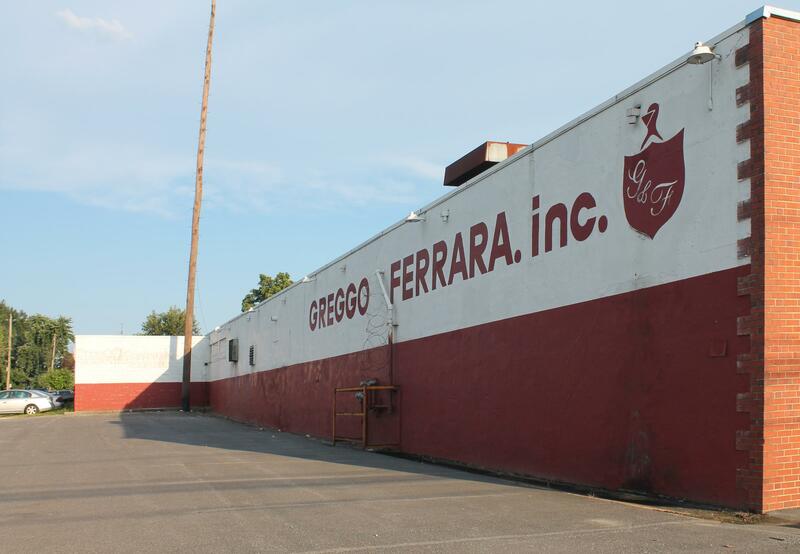 Greggo Ferrara is located directly adjacent to some houses in Hamilton Park. Casey says the County intends to involve the community in any decision-making processes — and that the community will be the first to see results of the survey. Joe Day manages Code Enforcement for the County. He says no other stakeholders have been consulted about relocation so far, but if the survey finds the community wants relocation, other partners would likely be brought in. Jim Smith, Assistant General Manager of Land Use with the County, adds that private partners could be engaged. He points out that with 198 inhabited parcels among the two communities, lots of uncertainty remains. County officials stressed the survey is not leading — for or against relocation. And they admit relocation would be a big challenge for the County. Perez’s team finished collecting survey data at the end of August. Perez sees his survey as just the first small piece of the research that needs to be done. He notes there are few precedents to follow. "The idea of relocation predicated on perceptions of environmental burdens, embodied experiences of environmental burdens, lived experiences of environmental burdens, is relatively novel,” said Perez. The Route 9 Corridor Land Use and Transportation Plan recommends that if residents request it, community relocation should be finished by 2027. County officials indicate that if relocation eventually happens, it will take much longer than that. But at this point, residents are eager for answers. Marcia Mason says the community is tired of fighting, and worries County government won’t move quickly enough. “If they have it their way, they’ll probably be waiting for another 15 years,” said Mason. “They need to go ahead and say what they’re going to do for us so we’ll know what we need to do,” said Whitehurst, of Hamilton Park. Perez says initial data analysis could be finished by the end of the month. Only then may the County decide what comes next. State lawmakers have given their blessing to a plan to put the Port of Wilmington in the hands of a private operator. A resolution signing off on a $580 million deal with Gulftainer to lease the port for 50 years sailed through both chambers of the General Assembly Tuesday. A polluted aquifer in Hockessin will get federal cleanup assistance, after being added to the U.S. Environmental Protection Agency's National Priorities List Tuesday. The First State is fighting back against a decision from the Environmental Protection Agency regarding out-of-state pollution to Delaware’s air.